The strange story of the rise in self-employment just got stranger. Chris Giles wrote a piece in the FT this week arguing that most of the increase is due not to lots more people becoming self-employed but to lots more people not leaving self-employment who would otherwise have done so. There has, he said, been no surge in the number of people going into self-employment. This is based on the ONS Economic Forum report which found greater increases in the number of the longer-term self-employed, implying that a lot of people are staying self-employed. 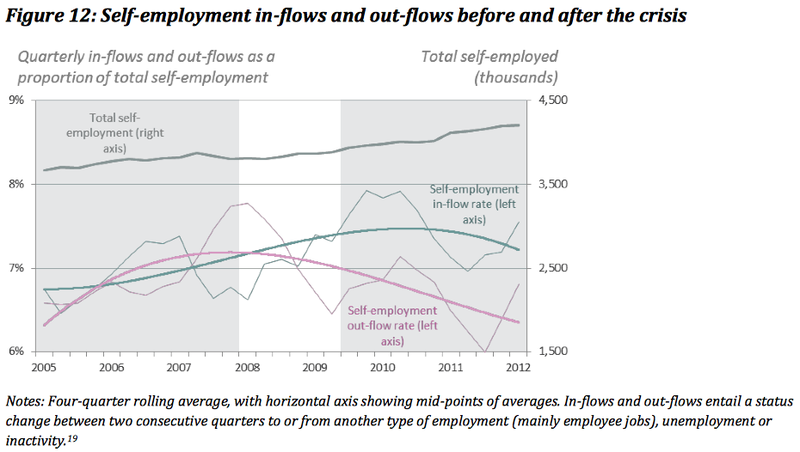 The Resolution Foundation also found that the slowdown in outflows was a significant factor in the increase in self-employment. However, they still reckoned 72 percent of the post-recession rise was due to people entering self-employment and only 28 percent due to the decline in outflow. Someone with more time than I have will no doubt dig into the ONS figures over the next few days and explain this in more detail. If Chris is right, though, this is an even more bizarre story. It suggests we have had a 700,000 increase in self-employment since the recession mostly because fewer of the self-employed went back to employment or retired. If that’s the case, you can’t even blame the catastrophic collapse in self-employed earnings after 2008 on there being lots of new people who didn’t know what they were doing. If Chris is right, this is old timers seeing their business shrink, rather than newbies trying to find their feet, under-charging and messing things up. The same goes for the increase in the number of self-employed tax credit claimants and the steady rise in non-employing and non-VAT paying businesses. If there has been no surge in new entrants, then either a lot of low profit and low turnover businesses are hanging on in there, or a lot more of them have become low-profit and low turnover businesses since 2008. Whatever has caused the rise in self-employment, one thing is clear. 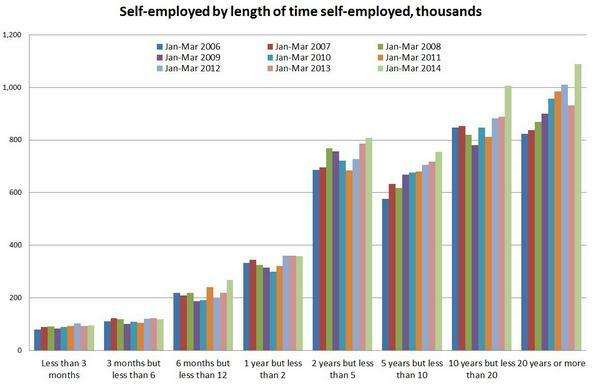 Since the recession, the economics of self-employment have been truly frightening. Chris says we should stop complaining because self-employment boosts tax revenues. It hasn’t done much boosting in recent years though. Despite the increase in numbers of people, the declared income of the self-employed was down by £8bn between 2008 and 2012. 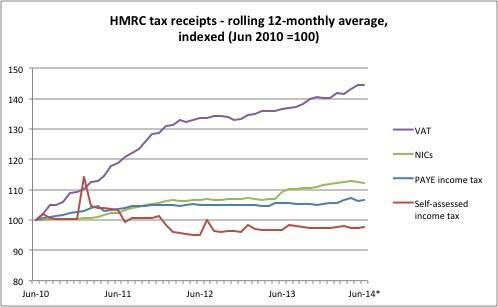 This might have improved recently; we won’t really know until we get the next full HMRC stats until January. Michael O’Connor’s chart based on the recent HMRC report suggests self-assessment income (or which self-employment income is a substantial part) continued to fall after 2010, even as the numbers of self-employed rose. It may be that self-employed earnings pick up again. The Chancellor thinks he’s going to get bumper revenues next January when the newly flush self-employed pay their taxes. The pay data from the last few years don’t give much cause for optimism though. Even if self-employed earnings are up, it’s difficult to see them making up the ground lost since 2008 for some years yet. Debates about the reasons for the increase in self-employment and its demographics will rumble on. What we do know, though, is that the economics of self-employment, in terms of earnings, benefit claims and tax revenues, have been utterly dire. I am no expert in these fields but my understanding from friends who are below retirement age is that they prefer to be registered as self-employed as their entitlement to welfare benefits is more comfortable and they are not hassled by the DWP as a result. They receive some sort of financial support in the form of tax credits and/or other forms of welfare support but without having to endure the rigmarole of claiming unemployment benefit. A clear explanation as to how the scheme operates might help to make this understandable – to me, if no one else. This all strikes me as part and parcel of the latest “wheeze” to massage unemployment figures so that they become literally incomparable and can be made to mean anything anyone wants. Yes, John’s anecdote has the ring of reality about it. The so-called welfare reforms (increased conditionality) are a significant factor in explaining the “jobs miracle” and the growth in low-quality jobs. Does the analysis take into account the large and perhaps increasing number of individuals who have retired from employment early, sometimes by choice, sometimes by necessity, on pensions that are not really adequate to support them? In my experience there are huge numbers of such people who register themselves as self-employed, set up one man companies etc and do a small amount of consultancy /contract work to supplement their pension incomes. I guess they don’t count as retired, but neither should they be regarded as relying on self employment for their living. I suspect a significant proportion of the apparent boost in self employment is people in this category. It’s not necessarily a bad thing and those doing it may be entirely content. However, it may mean that the rise in self-employment does not betoken any fundamental shift in desire to “go it alone” across the working population: Instead, decreasing security in full-time employment and downsizing pressures are prompting those – usually older people – that have at least some financial cushion to fall back on to get out when they can. Maybe the self-employed are deferring invoices to qualify for benefits within a certain tax period. This resonates with something I heard on Wake Up To Money a couple of months ago. They had a Professor from Lancaster Univeristy on discussing the riise in self employment and he reckoned that in this recession more of the self employed planned to stay self employed than in past recessions, but he didn’t say why. 1) Staying self employed and maybe perhaps once in a blue moon getting a nice payday, maybe even a windfall. Then it’s not surprising that people will continue to ‘roll the dice’ and stay self employed for as long as possible, even though the success rate and prospects are miserable. the upward pressure of s/e is very real, and lauded in some quarters. I’m with FCR in saying that the jury is v much out on whether this represents a new rise in entrepreneurship. there’s a bit of that certainly but three other factors are important. First is the more generous welfare regime for this group. My old DWP pals are worried about this but the impact of Universal Credit in tackling this is quite a way off. Second I’d offer the thought that s/e is increasingly used as an income supplement for those already receiving pensions from early or partial retirement..No idea wheter the data on this is available. thirdly always worth remembering that the income tax regime can make s/e quite pleasant for a while by offering cashflow advantages in payment patterns and a more relaxed approach to expenses..
All of which fails to mention the other advantage of SE. Evading payment of tax. Even better if you evade tax and then continue to claim working benefits due to low income. Educating the future business person? Cor, Chris Giles’s charts are awful.